The phrase "New Jersey Pine Barrens" often conjures images of desolate forests and even the piercing red eyes of the Jersey Devil. While those just might be true, there are over one million acres in southern New Jersey filled with remarkable people, charming communities, natural wonders and man-made marvels. Conservationists from around the state strive to protect the region from overpopulation and preserve the pristine wilds. From sweetly scented pines, blueberry and cranberry farms and family businesses to the proud inhabitants who welcome thousands of visitors every year, discover what makes the Pine Barrens one of the most beautiful regions in the Northeast. 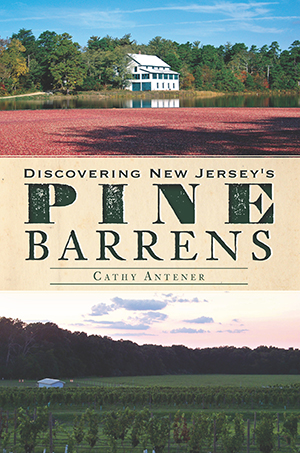 Cathy Antener has had a fascination with the New Jersey Pinelands since moving to this area from Monmouth County, New Jersey, in the late 1970s. A career in the Ocean County Parks and Recreation Department enhanced her knowledge, and in 1998, she created PineyPower.com, a website covering just about everything about New Jersey's Pinelands. With its extensive information, photos and calendar of events, the website has grown to over 150 pages and has become a favorite for thousands of fans of the Pinelands across the country and even the world. Cathy has taken her knowledge to another level: for the past several years, she has offered guide services for bus companies and tour operators bringing visitors to the Pinelands area. She organizes and narrates full-day tours for groups from fifteen to fifty, sharing her knowledge of the area by offering narrated tours of the cranberry and blueberry harvests, Pine Barrens, wineries and Pinelands coastal areas. She also assists a local master basket weaver in teaching the ancient art of basketry to groups in the area. Cathy frequently explores the million-acre Pinelands preservation area, where she might canoe, hike, visit museums or just enjoy the local restaurants and shops and chat with its colorful and friendly residents. Since Ocean County contains so much Pinelands area, Cathy sits on the Board of Directors of the Southern Ocean County Chamber of Commerce, an active tourism-based organization of over five hundred members. Cathy lives in the Pinelands of Barnegat, where her own naturalized property is the setting for many of her nature photographs, including plants, birds, insects and even an occasional endangered plant.